The BahÃ¡'Ã­ House of Worship, Wilmette, Illinois, USA. What do the human rights of minorities in Iran, in the Middle East, have to do with Africans, writes MAZIAR BAHARI. I started to answer this question when I made my film The Cost of Discrimination in 2017. The film follows the life of an Iranian economist, Dr Iraj Abedian, who has lived in South Africa for many years and who was an economic adviser to Nelson Mandela. Dr Abedian is also a Bahaâ€™i â€“Â a member of Iranâ€™s largest religious minority. Dr. Abedian represents what Iran loses by persecuting the Bahaâ€™is. Iranâ€™s loss was South Africaâ€™s gain; aside from serving Mandela, Dr Abedian runs a successful consulting business, and continues to promote South Africaâ€™s best interests at home and abroad. He is now as much a South African as he is an Iranian. 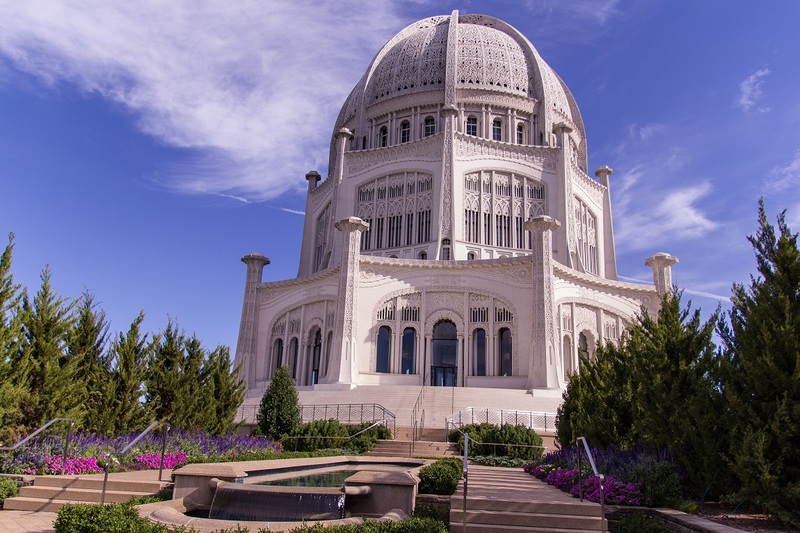 Many people across all African countries know of the Bahaâ€™is â€“Â because although this religion began in Iran (where it is the largest religious minority) there are also many African Bahaâ€™is. Kampala, in Uganda, even has a Bahaâ€™i House of Worship, and Bahaâ€™is across the continent help their communities to make a better prosperous future for Africa. One inspiring example is a Malawian woman named Maina Mkandawire. Maina began a school in her spare time and without any funding, in the capital of Lilongwe in 1993, with only a few dozen children. Twenty-five years later the school now serves more than 800 students. I myself am not a Bahaâ€™i. But in Iran, my homeland, the Bahaâ€™is are persecuted by the radical Islamic government. More than two-hundred Bahaâ€™is were killed after Iranâ€™s 1979 Revolution. Hundreds of others have been unjustly jailed and tortured. And today more than a hundred Bahaâ€™is are in Iranian jails and theyâ€™re deprived of their most basic rights as citizens of Iran. They are not allowed to teach or study at Iranian universities and many employment opportunities are not open to the Bahaâ€™is. You could say that the Iranian government imposes a kind of apartheid on the Bahaâ€™is. I do not use that word lightly. The Cost of Discrimination looks at the parallels between the apartheid system â€“Â which for nearly 50 years discriminated against and oppressed the majority population of South Africa â€“Â and Iranâ€™s persecution of the Bahaâ€™is. The scale is of course different: Iranian Bahaâ€™is are a minority not a majority. But the ruling classâ€™s desire to maintain control at all costs, its methods of denying access to education and other rights, to enforce its will through detentions and violence, and to give religious reasons for its actions, are almost identical between the South Africa of the past and the Iran of today. The Bahaâ€™i method of resisting this repression are peaceful and inspiring. After the 1979 Revolution, when they realised that the government was not going to allow them to study in its universities, they decided to create their own â€œundergroundâ€ university called the BIHE (the Bahaâ€™i Institute for Higher Education). BIHE students attend secret classes in each otherâ€™s homes as well as online lecturesÂ and many of its graduates have later gone to some of the worldâ€™s leading universities. The BIHE is one of the longest-running, most successful but least known forms of peaceful resistance the world has ever seen. My colleagues and I now plan to show three films we have made about human rights and the plight of the Bahaâ€™is in Iran in seven different African countries over the next few weeks. The films are To Light a Candle (2014) about BIHE, the underground university, Changing the World, One Wall at a Time (2017) about our street art campaign across the world to raise awareness about the plight of Bahaâ€™is, and The Cost of Discrimination (2017). We will visit Gambia, Kenya, Lesotho, Malawi, Rwanda, Senegal and South Africa, partnering with civil society in each country to show these films. We are doing this because human rights in Iran should not be talked about only by the usual players â€“Â whether Iranians like me or western countries or even human rights organisations like Amnesty International. Human rights are a global issue and every country has a voice. And many people in Africa, as well as African governments, have a more recent and acute understanding of the cost when these rights are denied. The United Nations calls Iran to account every year for its human rights crisis. Reports at the Human Rights Council and a regular vote at the General Assembly shine a light on the many violations against not just the Bahaâ€™is but other religious and ethnic minorities as well as journalists, civil rights activists and women. I hope that by showing these films and helping my colleagues and friends across all seven of these countries to discuss the role of African people in promoting human rights around the world, we can learn whether African states can also help this cause. The United Nations reports and votes need international support if they are to pressure Iran to respect the rights of all its citizens. Iran claims it has much influence on the continent; if this is true, then it is important for African officials, journalists and civil society activists to have a better understanding of Iranâ€™s own human rights challenges. The best way to start a project like this is to go straight to the people â€“ to inform citizens of these issues and for citizens to encourage their governments to take a stand. I hope that these three films, and our events in Banjul, Nairobi, Maseru, Lilongwe, Kigali, Dakar and Johannesburg, can touch hearts and minds in Africa to look to your friends in Iran. On 2 November 2018,Â Wits University professor Salim Nakhjavani, journalist Saleem Vaillancourt and other special guests will be hosting a screening of the documentary film The Cost of Discrimination about the persecution of the Bahaâ€™is in Iran and its parallels with the apartheid system. The screening will be at Civicus, 25 Owl Street, Johannesburg, from 10:00. Maziar Bahari is an Iranian-Canadian journalist and filmmaker. Bahari came to international attention in 2009 when the Iranian government detained him and placed him in solitary confinement after a disputed presidential election â€“ this story was told in his book “Then They Came for Me” and Jon Stewartâ€™s film Rosewater. Today he is Editor-in-Chief of IranWire.com.